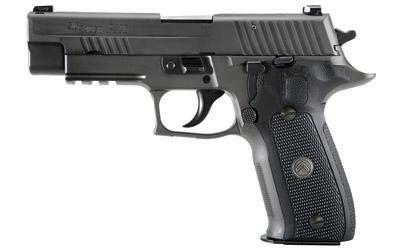 Sig P226 Legion SAO 9mm 4.4"
Sig Sauer's Legion series has a Legion Gray PVD finish on the slide and frame which has a reduced and contoured elite beavertail and is relieved under the trigger guard (XFIVE Contour). Legion also has enhanced checkering on front strap and under trigger guard, and custom, high checkered G-10 grips. The Legion series features a Master Shop Super Match Flat Trigger, enhanced action with SRT, a solid steel guide rod, and is topped off with Sig Sauer Electro-Optics X-Ray3 High Visibility Day/Night Sights.